Aaron McEneff celebrates the second goal of Rovers' 2-0 win against Derry City last Friday. THE SHAMROCK ROVERS players were assailed with chants of ‘it’s happened again’ as they trooped off the pitch at Dalymount Park on Monday night – a 1-0 loss to Bohs meant a fifth defeat in six derbies; the kind of deja vu that visits with particularly bad tidings. How better to move on, then, than beating the champions in Tallaght and fashioning something entirely new? 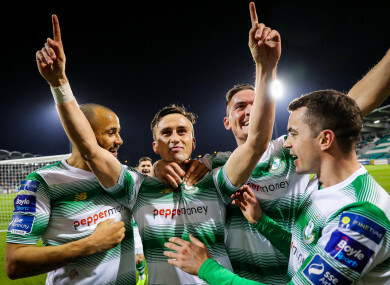 Cork City have long-since been Dundalk’s closest challenger, but given their level of off-season upheaval and indifferent start to the league, City may have vacated that role for this season with Rovers tipped as the team best-equipped to take up the cudgels. While Rovers lost for the first time this season on at Bohs, there were some extenuating circumstances – primarily the first-half red card to striker Aaron Greene. The striker was given a straight red for a challenge on Keith Ward, which Stephen Bradley maintains was the wrong decision. “I’ve watched it back numerous times and at most it’s a yellow card for Aaron Greene”, Bradley told the Shamrock Rovers website. The two players have their foot on the ball and neither of them actually touch each other. What catches each other are their bodies, their feet don’t touch. You can see by Aaron’s reaction when he turns to get away from the other player, he knows he hasn’t touched him. Rovers maintain an enviable depth – they could afford to rest captain Ronan Finn along with Roberto Lopes and Dan Carr for Monday’s derby – and even with ten men, they were the better side at the start of the second-half and wrung out a few good chances from the derby’s general frenzy. “It’s not good enough from us that we created some really good chances and we didn’t show enough to want to get on the end of those crosses from Trevor [Clarke] and Dylan [Watts]” says Bradley. As to who will be on the end of those crosses tonight, it’s in doubt: Greene won’t as he is suspended, new signing Orhan Vojic has been struggling with a rib injury although hasn’t been ruled out while Dan Carr may resume in the position he played as a Monday-night substitute. Rovers will also be without Ethan Boyle, although Dylan Watts should recover from the knock that forced him off against Bohs. Prior to that defeat, Rovers were two-from-two: a relatively comfortable 2-0 win at home to Derry City followed a last-gasp win at Waterford. The quality of their midfield play was evident in the former, with their ability to knit passes between Jack Byrne, Aaron McEneff, Ronan Finn and Dylan Watts more effective than Derry’s direct style at a very windy Tallaght Stadium. Dundalk, meanwhile, staved off talk of an early-season crisis under Vinny Perth with a come-from-behind win against UCD on Monday, having drawn their opening two games with Finn Harps and Sligo Rovers. While Dundalk made a similarly slow start to last season – drawing their opening two games, the second against Rovers – they arrive at Tallaght depleted by injury. Robbie Benson and Patrick McEleney are definitely out, while Sean Murray is also likely to be missing through injury. Jamie McGrath should return, however, and, first team coach John Gill says that the champions’ first Dublin trip of the year need not define their season. It may not be a definitive game for Rovers, but it is an opportunity to send out a warning and stake their claim as the leading contenders for Dundalk’s crown. Email “Dundalk's visit to Tallaght offers Rovers chance to stake claim as main challengers ”. Feedback on “Dundalk's visit to Tallaght offers Rovers chance to stake claim as main challengers ”.